I made soup last week and bread this week. Fall is definitely here. I’m still not quite ready to go full on “braise” but roasted veggies, especially over something hearty but still healthy… yup, I’m down with that. 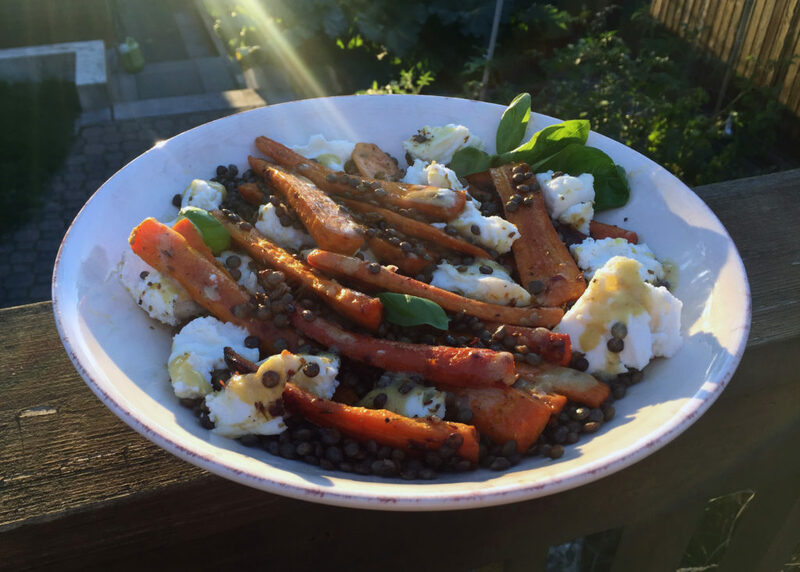 I was at Costco last week and bought a “YUGE” bag of carrots for, like, zero dollars and went decidedly French by pairing them with Puy lentils. You guys, if you haven’t added those tiny, green French lentils to your repertoire you are missing out. They are so easy to cook properly if you soak, then steam them (just say no to mushy lentils) and they are delicious warm or cold. Use them as a base for almost any roasted vegetable as I did here, or toss them in a salad. (Or simply season them and add a fried or poached egg on top… oh yes I did!). And they’re healthy. I almost hate to say that because it’s beside the point. They are delicious… just go with that. This dish is hearty enough for a vegetarian main but it can also be served alongside some protein (or that egg we just discussed). 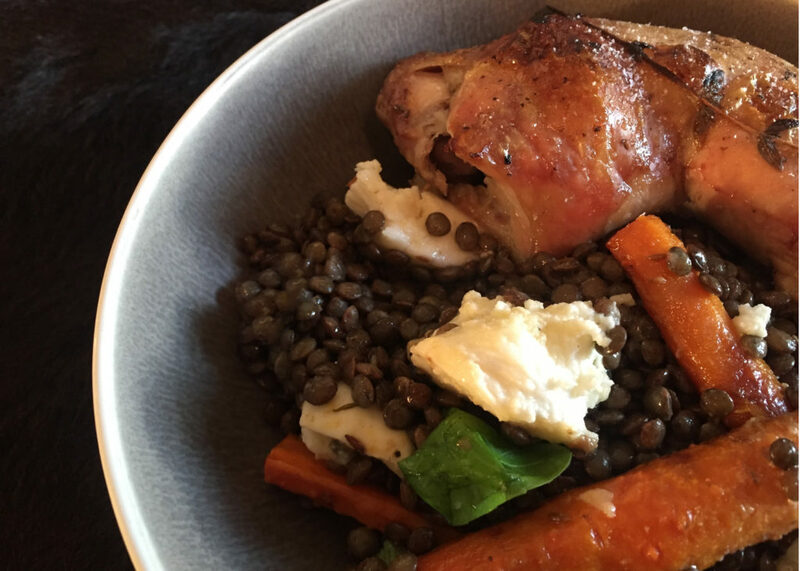 I served mine with a couple pieces of chicken confit I had in the fridge which I simply reheated by adding to the tray of carrots when I removed the tinfoil. Anything to save washing another dish! Make dressing by combining all ingredients except olive oil. Slowly drizzle in oil while whisking until emulsified. Set aside. Cook lentils to your liking. I soak mine for at least a few hours or overnight, then steam for 15-30 minutes (depending on how long you have soaked) until just tender but not falling apart. 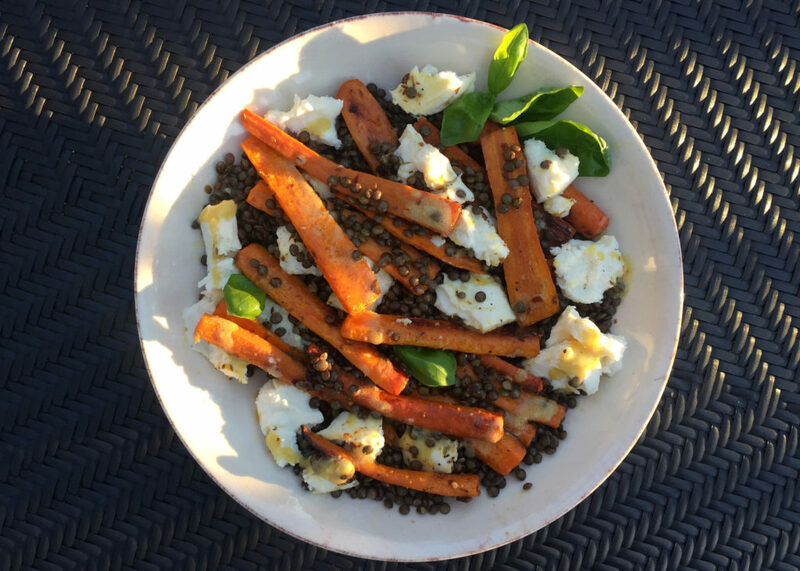 Put drained lentils in a larger wide bowl (enough to accommodate the carrots) and stir in 3 TBS of dressing while they are still warm so the lentils absorb the flavour. Set aside. Combine your spices in the bottom of a bowl along with minced garlic, red wine vinegar, olive oil and lemon zest. Add carrots and toss to coat. Place on oiled cookie sheet along with your zested lemon halves (cut side down) and cover with a piece of tin foil. Roast for 20 minutes. 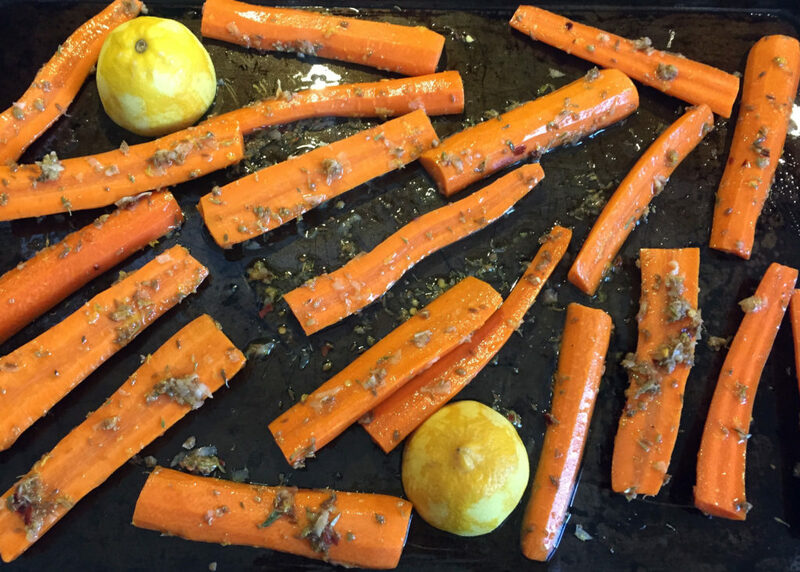 Uncover, toss and roast another 15-25 minutes until carrots are tender and browned in spots. 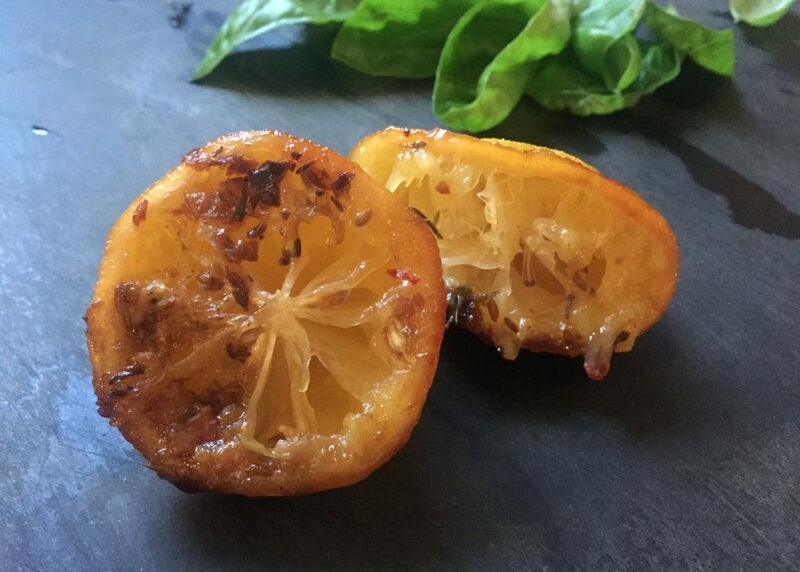 Remove from oven, squeeze over juice from roasted lemon. 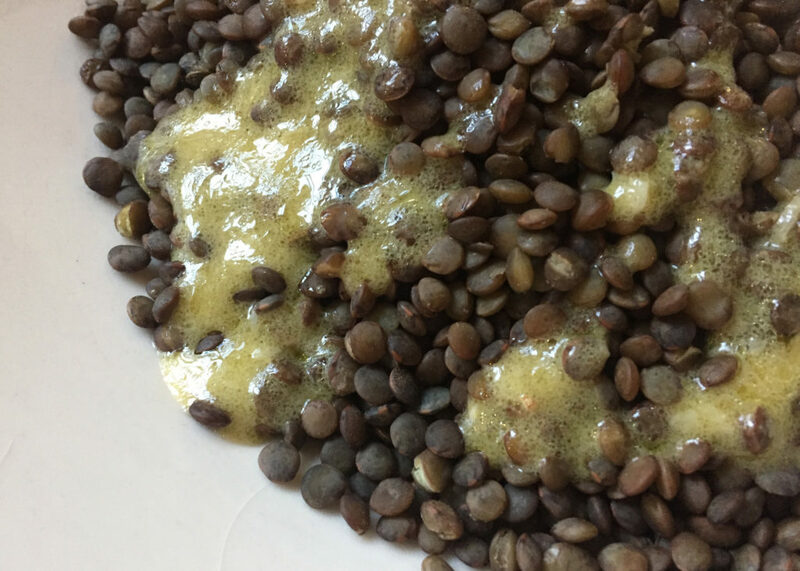 Taste and re-season lentils if necessary (they may need more salt, especially if you skipped the anchovy paste). Tip carrots over lentils and gently toss. Tear fresh mozzarella over the dish and drizzle with remaining vinaigrette to taste. Scatter fresh herbs on top if using and dish up!